Chief economic strategist at the Progressive Policy Institute in Washington; Other affiliations:president, South Mountain Economics LLC; senior fellow, Mack Institute for Innovation Management, Wharton; former chief economist, BusinessWeek; author of the textbook "Economics:The Basics" (2nd edition). Laura Weidman Powers, executive director and co-founder of CODE2040, has a vision: She wants her organization, founded in 2012 and based in the Bay Area, to encourage “Blacks and Latinos to enter the tech workforce at a greater rate, and to stay and succeed there as engineers, technologists, thought leaders, executives, and entrepreneurs.” Edward Avila, CEO and co-founder of the Manos Accelerator in Silicon Valley, has a vision as well: He wants his new organization to ease the way for the next generation of Latino-led tech start-ups. And NewMe Accelerator, intended to “educate, accelerate and empower” minority and women tech entrepreneurs, is going to be running 3-day “PopUp” events in Miami, NYC, and Kansas City over the next few months. The number of Hispanics/Latinos employed in computer and mathematical occupations has risen 26% over the past two years, compared to a 10% overall gain in tech employment. The number of Asians employed in computer and mathematical occupations has risen by 19% over the past two years. These positive signs of diversity show up clearly in the chart below. For the rest of this post, I’m going to focus on Hispanics/Latinos, who have been noticeably under-represented in the tech fields (in future posts I will look at blacks, Asians, and women). The Hispanic share of computer and mathematical occupations in the U.S. basically stagnated for a decade. Data from the Department of Education allows us to look at the number of Hispanic computer science graduates. From the 2007-2008 academic year to the 2010-2011 academic year, the number of computer and information science bachelor degrees going to Hispanics rose by 23%, double the overall rate of increase. That’s good news. 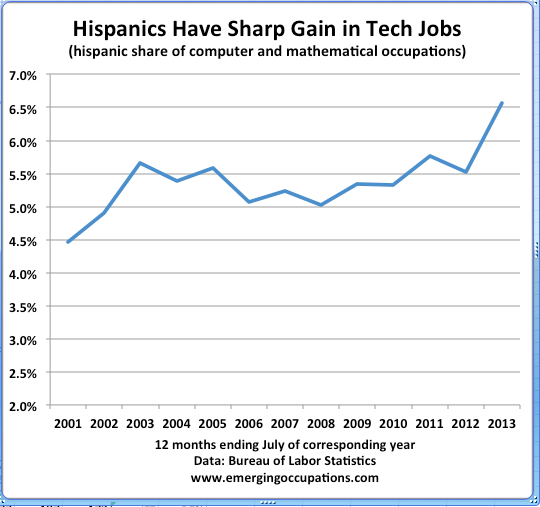 The schools are producing more Hispanic computer science grads, and they are finding jobs. 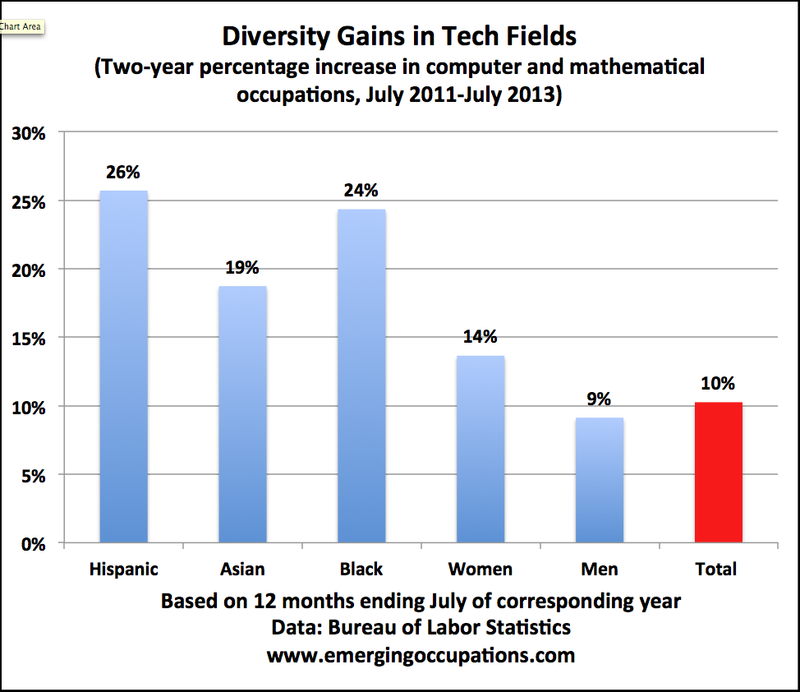 There’s still a lot more to do on diversity, but in the tech field, things seem to be getting better rather than worse. Can you prosper by choosing a ‘creative’ occupation? Many young Americans are naturally drawn to creative occupations, such as artists, designers, entertainers, sports, and media workers. (yes, I know that sports don’t seem to belong there, but that’s how BLS breaks out the workforce). These occupations seem to be both more interesting and less susceptible to foreign competition. These occupations make up part of what urban studies expert Richard Florida called the creative class. The problem: Many Americans working in these creative occupations lost their jobs during the early stages of the crisis. Panicked corporate execs saw little need for designers or artists when the world seemed to be collapsing. But now creative workers have something to rejoice. Employment in arts, design, entertainment, sports, and media professions has exceeded 3 million for the first time, and finally gone above pre-crisis levels. This is not a mere flash in the pan. 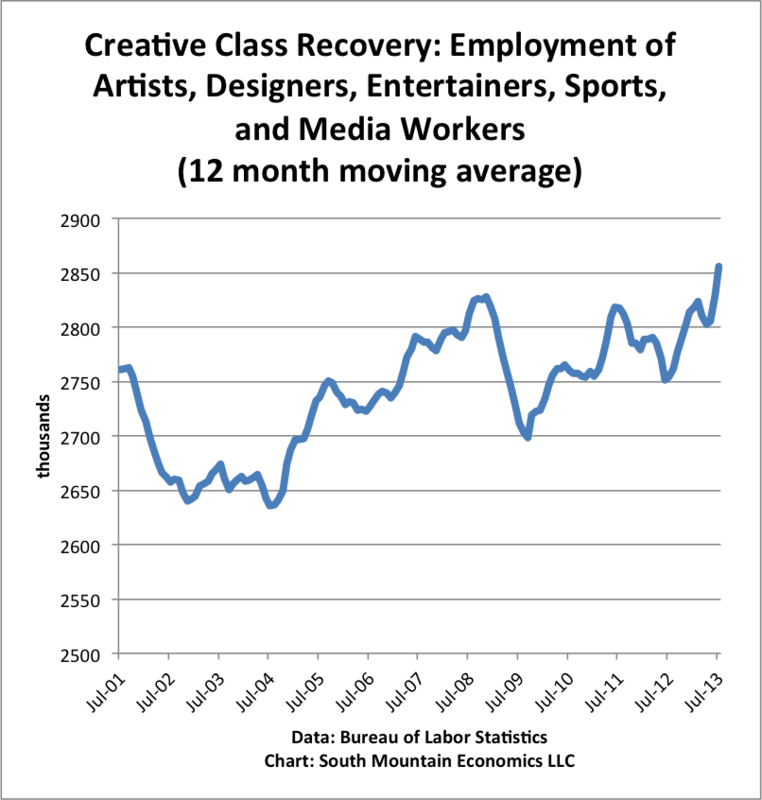 If we look at 12-month moving averages, we see the same pattern, where employment in the creative occupations has finally decisively climbed above their previous peaks. In future blog items, I will delve more deeply into the details of this recovery. But it may be that ‘creative’ is finally starting to pay off. Added: Want ads for these creative occupations are up 12.8% over the past year (comparing June 2013 to a year earlier). That’s compared to a 5.3% gain for all want ads. Some of the big gainers include graphic designers (as I pointed out here) and film and video editors. Is the Solar Job Boom Finally Here? … the same price decline that has hurt panel manufacturers has helped sustain demand in the face of disappearing subsidies. That means a number of businesses, such as those that install household solar equipment, continue to thrive. Moreover, the low interest rates make it easier to finance solar installations. As a result, we are seeing sharply rising demand for solar installers and solar sales representatives. Over the past year, help-wanted ads for solar photovoltaic installers has risen by 20%, and ads for solar sales representatives are up by 27%. Help-wanted ads for solar thermal installers are up by a startling 61%, though that’s off a small base. Conversely, want ads for solar energy systems engineers are down over the last year, showing the overcapacity on the production side of the solar economy. It’s possible that the gains for solar jobs may temporarily shrink if interest rates rise. But it seems pretty clear that solar installers and solar sales representatives are key examples of emerging occupations. 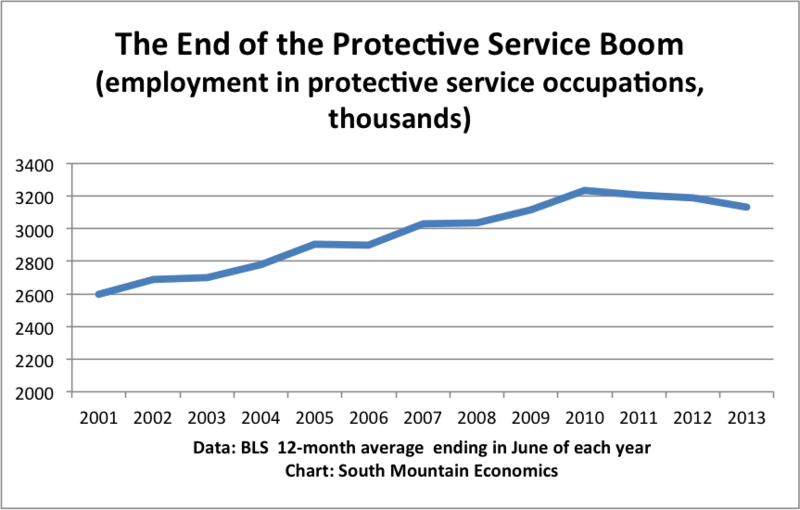 Journalism employment rebounds sharply–but what kind? Journalism is simultaneously a declining and emerging field. The mainstream print and broadcast media continues to shrink. Newspaper employment, for example, is down about 5% over the past year. But these are not traditional journalism jobs. Roughly half the want-ads for news analysts, reporters and correspondents contain the words ‘digital’, ‘internet’, ‘online’, or ‘mobile’. 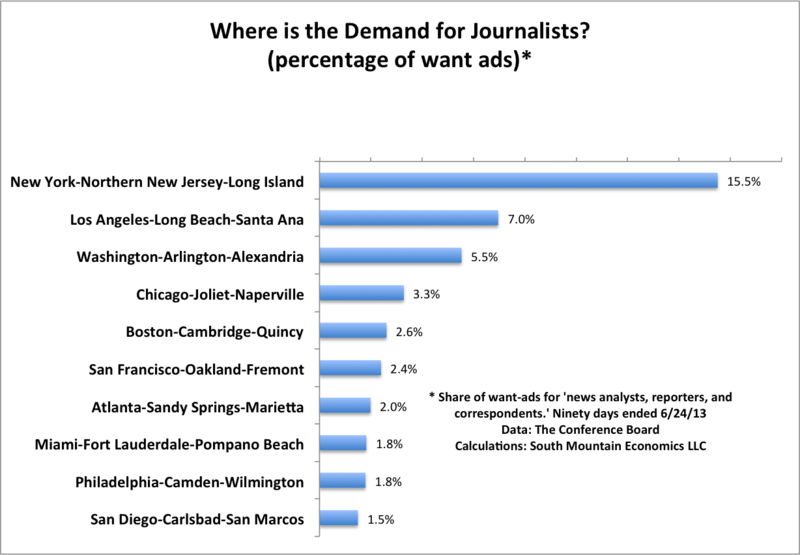 Roughly a quarter of the want-ads include the phrase ‘social media.’ These jobs require a different set of skills than traditional journalism positions. *Calculations of employment are based on the Current Population survey; the 12 months ending May 2013 vs the 12 months ending APril 2012. The want-ad data is based on The Conference Board HWOL database; the last 90 days of ads.